For a long time, Kant’s Doctrine of Right has languished in relative neglect, even among those who wanted to defend a Kantian position in political philosophy. Kant’s more interesting claims about politics were often said to be located elsewhere. This groundbreaking anthology corrects that, examining a wide range of issues discussed in the Doctrine of Right and other closely related texts, including Kant’s views on social contract theory, private property, human rights, welfare and equality, civil disobedience, perpetual peace, forgiveness and punishment, and marriage equality. Each of the contributors tests Kant’s arguments for possible political application, reaching different—and sometimes opposing—conclusions. The result is a highly original book that not only enhances our understanding of Kant’s political philosophy, but also invites substantive debate within the Kantian tradition and beyond. 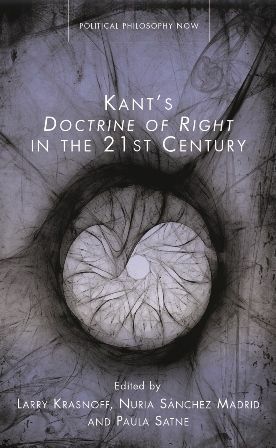 "The most important advances in Kant scholarship often appear as collections of essays; this essential volume on Kant’s Doctrine of Right and twenty-first-century political philosophy is no exception. In good Kantian fashion, the essays apply cutting-edge scholarship to produce pairs of contrasting answers to key questions in political philosophy." "This collection of essays evidences the exciting capacity of Kant’s thought to continue opening new spaces for reflection within the most pressing contemporary debates. The essays within this volume demonstrate that Kant’s much-neglected Doctrine of Right stands alongside Rawls’s Theory of Justice and Darwall’s Welfare and Rational Care in its capacity to challenge our contemporary individualism and prompt us to search for a more expansive, socially responsible political theory."